Visit AT&T Wireless online at WirelessATT.com which is the largest wireless company in the United States, with more than 73 million subscribers. AT&T Wireless is the first nationwide wireless carrier to be awarded the wireless quality consumer information code and has the nation's fastest 3G network. AT&T Wireless offers unlimited calling as well as rollover plans within the largest mobile-to-mobile calling community. Save on your next purchase from AT&T Wireless with AT&T Wireless discounts, AT&T Wireless coupons, AT&T Wireless promotions and AT&T Wireless savings from 58coupons.com. Save up to $50 on select phones, devices or accessories with qualified service activation. 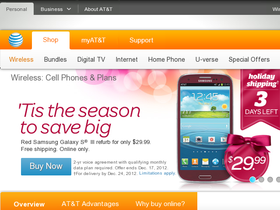 Offer requires online activation via att.com/wireless on qualified rate plans $39.99 or more with a two-year agreement. iPhone and certain other devices not eligible. Discount will be automatically applied to your shopping cart. Credit approval and other restrictions apply. Act now to save up to $36 on select Top Music Phones + free shipping from AT&T Wireless. CLick link for selection. Check out the GoPhone Packages from ATTWireless.com starting from $29.95. Click link to start. For a limited time, check out these free phones and get free shipping from At&t.com.